The Chileno Valley Vineyard was planted in 1990 to multiple French clones of Pinot Noir. This low vigor site is perfect for cool climate Pinot Noir. 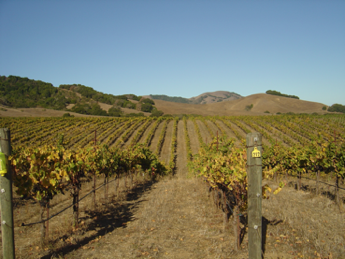 The well drained Los Ososos-Bonnydoon Complex soils and the extremely cool weather of the "Petaluma Gap" allow for one of the longest growing seasons in California. Our section of Pinot Noir consistently ripens in mid-October, quite late compared to the nearby Russian River Valley or Sonoma Coast. This longer growing season allows us to pick our grapes at relatively lower sugars with bright acidity. The 2006 Vintage was harvested on October 22. Our 2 ton lot was fermented without the addition of yeast in small, one ton, open top bins. We utilized 20% whole clusters in the fermentation to increase complexity and provide additional structure. After a long cold soak, the natural yeast fermentation became apparent on about day 8. After a total of 23 days of skin contact, the must was gently basket-pressed straight to barrel. The wine was aged "sur-lie" for 10 months in 40% new French Oak, primarily 3 year air dried wood from the forests of Troncais, Allier and Bertranges. We opted to forgo the use of any Sulfur Dioxide until bottling. This somewhat un-conventional technique allows for more complexing of color and flavor in the wine, as sulfur inhibits many critical reactions that occur during the crucial early stages of development. Because we were not afforded the protection sulfur provides, we carefully monitored each barrel for any sign of problem throughout the barrel aging. Strict adherence to cleanliness was surely responsible for us succeeding in this risky but ultimately rewarding technique. The wine shows deeper color, a more satiny structure and increased flavor intensity due to the elevage sans SO2. The wine has a wonderful nose of rhubarb, wild cherry and redwood forest floor. These flavors are echoed in the mouth and highlighted by the structural tension. The texture is at once both firm and satiny. The balance of acidity and tannin allows the fruit and spice flavors to linger and finish quite strong. Drink today through 2013.